Our 18 years of experience in sunglasses for dogs has finally yielded this great lines of Doggie Shades. These high quality glasses all come with impact resistant, optically correct UV protected and glare filtered. The adjustable elastic strap will custom fit any dog. Originally, dogs were designed to be night time predators. Since becoming domesticated, adding many years to their lives and developing many breeds to do different tasks in life. Very little can be done for their eyes, and so cataracts develop, as any veterinarian will agree. Doggie Shades help stop the condition as well as watery and sensitive eyes. You will probably experience a happier and prouder pet then ever before. DOGS WEAR SUNGLASSES QUITE EASILY! With our easy fit and comfortable design styles along with our instructions and training pamphlet, your dog will probably be sporting a pair within a few moments of trying them on… GUARANTEED! Visit our photo gallery and check out the pride and happiness displayed by these dogs, and note, every dog shown has worn these sunglasses less then 10 minutes, for the first time EVER! 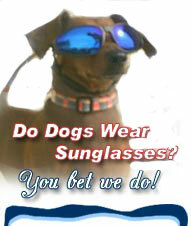 Please check out our wholesale page if you interested in becoming a distributor for Doggie Shades?